Do you ever just grade students on discussion? The quick answer is, “yes, I have graded students on discussion.” Discussion is, after all, embedded in our state standards. But I’ve become incredibly careful about when and how I attach a grade to a discussion. It’s no surprise that my mistakes have cleared the path to a more tempered understanding of discussion’s role in how a learner constructs his or her understanding. I remember following the urging of a veteran colleague who convinced me to print off class lists and make a tally mark next to each student’s name when he/she talked in order to assign a discussion grade. All that did was privilege quick responses and my extroverted learners. I remember using a matrix with criteria like: asks a follow-up question, uses a metaphor as part of a response, makes a connection to something else we’ve read or answers a question using new insight. It was a step in the right direction, but that matrix assumed a discussion could actually hold all of those contributions. I learned discussions felt artificial because students were so concerned about getting their matrix checked off, they couldn’t truly listen and the discussion couldn’t grow in authentic ways. I remember grading Socratic Seminars and Literature Circles. Again, closer to the goal of students driving the discussions, but also closer to students being so attached to their graded preparation that they couldn’t have generative conversations. Now I rarely grade discussions. In fact, I can’t remember the last time I did. However, discussions are central to our work. Daily. 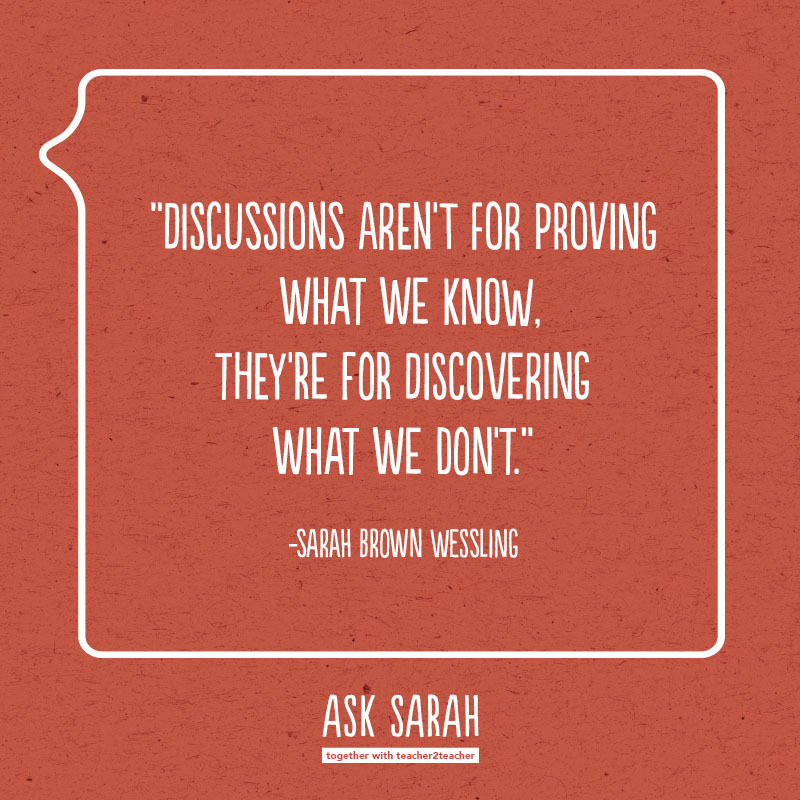 I’ve learned discussions aren’t for proving what we know. They’re for discovering what we don’t. And I don’t want to grade discovery because it’s too quiet and too loud, too unpredictable and too certain, too individual and too collective, too timely and too premature. But for all it’s dichotomies, discovery is central to constructing learning. Discussion perpetuates the learning. It’s the impetus for that night’s homework. It’s the catalyst for coming up with a project idea. It’s the creator of purpose for the next reading. It’s the crucial encounter in the writing process. It’s the way we come to understand the learner in each other, the learner in ourselves. If you find you need to grade discussion, just be sure it never becomes a punishment for not contributing quickly enough or often enough. Be sure your learners don’t associate discussion with a punitive point system that is sure to close down their thinking rather than opening it up. Give those discussions room to breathe and your learners will flourish in the fresh air. That’s a fantastic question. First, I try to give them a lot of thinking time in advance or even a chance to write down their thoughts. Sometimes I’ll quietly let them know that I’m either going to call on them for the next question or I’ll suggest they ask the next question. The reasons they don’t speak up are usually varied. Sometimes it’s because they are self-conscious, because they had one good idea and someone else just took it or because they aren’t prepared. At the end of discussion I often have all students reflect on what they learned. That can also be a way I determine how “present” that quiet student was during discussion.